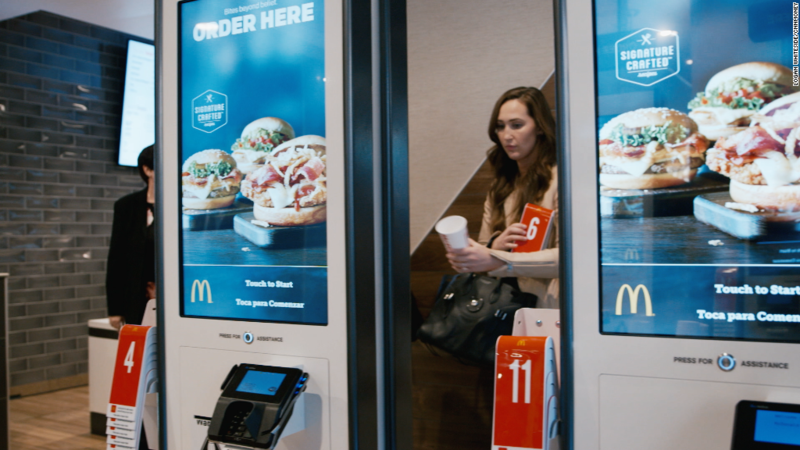 McDonald's is looking to beef up its sales with new tech. The company said Wednesday that it plans to launch an app where diners can place orders for pickup. It will also start expanding its delivery services. The burger chain says the kiosks it's already bringing to U.S. stores will be able to access customers' app profiles, which can store "customized favorites and preferred payment methods." The new app will also allow people to place orders for curbside pickup. And for diehard fans of the drive-thru windows that have been a hallmark of the restaurant's business -- no more yelling your order through a car window. Customers can place an order via the app and then read a code to the drive-thru cashier. McDonald's (MCD) said the mobile order and pay option will be launched at 20,000 restaurants in the U.S. and abroad this year. The chain will be the latest to opt in for the increasingly popular ordering apps that are used by Starbucks, Chik-fil-A, Taco Bell and Chipotle among others. For those who would rather not visit a McDonald's at all, the company said it is "experimenting with different delivery models" to expand delivery services. While it already has a massive delivery business in China and other markets abroad, it's not available everywhere. The company said it's "uniquely positioned to become the global leader in delivery," boasting that in its top five markets, "nearly 75% of the population lives within three miles of a McDonald's." The idea behind these changes is to boost profits and draw back customers who've strayed away from the Big Mac maker. While its global sales are doing better than ever, sales in the U.S. declined last quarter, according to an earnings report posted last month. McDonald's is also facing tougher competition from rivals like Shake Shack, KFC, Taco Bell and Pizza Hut. "As customers' expectations increased, McDonald's simply didn't keep pace with them. Making meaningful improvements in quality, convenience and value will win back some of McDonald's best customers," the company said in a press release Wednesday.